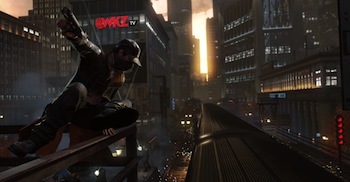 Watch Dogs' creative director says the Wii U version is graphically a step up from current-gen versions. While it's no secret that the Xbox One and the PS4 are graphically superior to Nintendo's Wii U, you would hope that it could at least out-perform its current gen cousins. Thankfully, Watch Dogs creative director Jonathan Morin has confirmed that the game will indeed look considerably better on the Wii U than on the PS3 and Xbox 360. "I would say the Wii U version is pretty much in between what the current gen is and what the next gen is from a version standpoint," Morin replied. "It's hard to position it. I would tend to say it's maybe a bit closer to current gen than next gen for certain things but it's a beautiful game on Wii U and it's cool to play it just on the GamePad." As for the game's Wii U exclusive features, Morin confirmed that Watch Dogs could be played on the Wii U GamePad in off-screen mode... but that's about it. "There are no new features or anything like that - it's the same game but we're optimising the controls for the beast that is the Wii U GamePad," he said. Watch Dogs will launch on November 19 in North America and November 22 in Europe for PS3, Xbox 360, Wii U and PC. The PS4 and Xbox One versions will come after each console's respective launch. On which platform will you be buying Watch Dogs for? Can your PC handle its ridiculous system requirements, or will this strictly be a console affair?